If you have an iPad or other tablet device then the chances are that more than once you’ve run out of power and not been near anywhere that has a mians outlet where you can plug in and recharge. A power bank could save you time and increase productivity by allowing you to work on the go for longer. When you can’t plug in to a mains outlet to recharge, the only realistic way to keep working on your iPad is to use a power bank or portable battery pack. These portable devices simply plug into your tablet anywhere and recharge them on the go. A power bank is an incredibly convenient way to recharge your iPad on the move and is rapidly becoming the most important iPad accessory. With that in mind, please read on below where we have summed up 3 of the best power banks with the high capacity required to charge iPod and tablet devices on the go. This beefy power bank has a 26,000 mAh capacity and features Apple like build quality with it’s Aluminium uni-body construction. This charger supports 5V to 24V outputs and is perfect for Apple Macbook Air, Macbook Pro, Macbook, Powerbook, iPad Mini, iPad and iPhone. This power bank has a monster capacity with the ability to provide up to 30 full charges to an iPod, plus the LCD display provides helpful information on the voltage settings and battery capacity. This latest model features an 18 months warranty and is 15% more efficient than the previous model, using the highest quality grade A Panasonic cells and will charge the iPad Mini over 3 times. 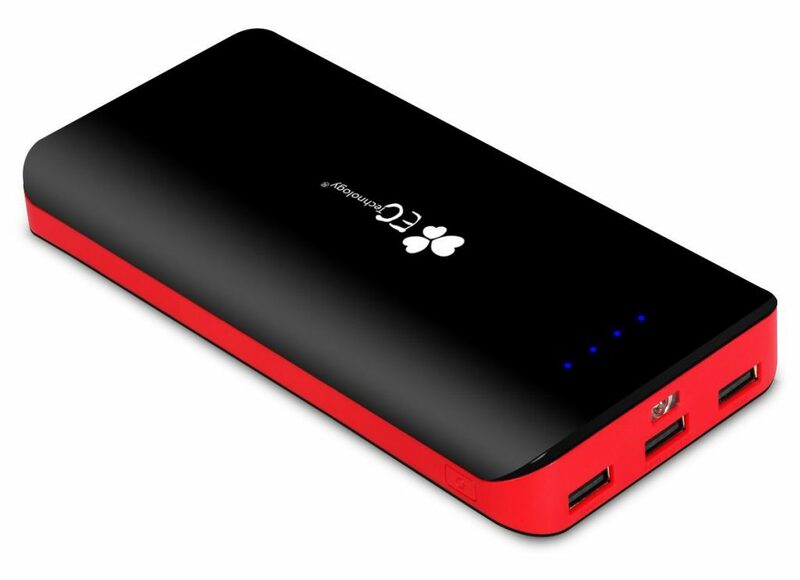 The EC Technology power bank has high-capacity with dual-ports and an LED torch. This versatile unit will charge Nexus, HTC One, Galaxy S4, S5, S3, iPhones, iPads and most other tablet devices and smartphones. The 22400mAh charging capacity and rapid input charging system makes this unit extraordinarily powerful and the 3 USB ports allow you to charge 3 devices simultaneously. Made with premium quality li-ion cells, the EC Technology 2nd Gen is good for 500 rechargeable cycles over the long battery life. With PowerIQ Technology and a huge power capacity, this Anker power bank was designed with the iPhone and iPad in mind, though it will charge a broad range of mobile devices including smartphones from Samsung, Nexus, HTC, Motorola and Nokia. This high-quality power bank offers fast charging speeds and is capable of fully charging your iPad Air from completely flat twice.